This sweet talkin’ woman won’t slow down. 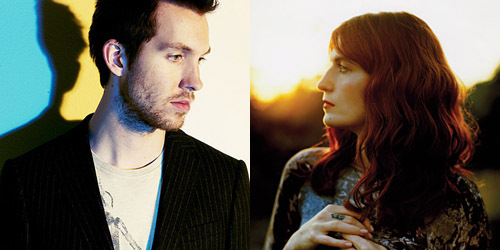 It’s still gaining on the radio even if it’s fallen back a bit on the Hot 100, but the single between producer Calvin Harris and singer Florence Welch is a hit, “Sweet Nothing”. It peaked at #1 in the United Kingdom back in October, but we’re always late when it comes to these kind of songs from overseas. In fact, “Nothing” peaked at #10 on the Hot 100 just last week. Today, we’ll be taking a look at some pretty sweet facts when it comes to these pop confections. Although we had some “sweet” singles in the 60’s like Brenda Lee‘s similarly titled “Sweet Nothin’s” (#4, 1960) and Neil Diamond‘s “Sweet Caroline” (#6, 1969), this list will be focused on those songs that hit the charts since 1970. The Harris/Welch collaboration marks the 25th song to pull off the feat since then. Get ready to sink your teeth into this. The 70’s were the sweetest of the decades of the list with eleven different top ten singles. Of them, only one went to the #1, the very first of them: “My Sweet Lord”, the 1970 single by George Harrison. It held down the top for three official charts and a one-week holiday break for a combined amount of four weeks. Another went as high as #3: Tony Orlando and Dawn‘s “Say, Has Anybody Seen My Sweet Gypsy Rose?” from 1973. Four top ten titles from 1971 featured the word “sweet” in them, the most of any year regardless of the decade on this list. They were “Sweet Hitch-Hiker” by Creedence Clearwater Revival (#6), “Sweet And Innocent” by Donny Osmond (#7), “Sweet Mary” by Wadsworth Mansion (#7) and “Sweet City Woman” by The Stampeders (#8). The latter two acts are generally considered one-hit wonders, though The Stampeders would find their way back to the top 40 for a grand total of one week in 1975 with a cover of “Hit The Road Jack”. Of the other five, three were by groups: Commodores (“Sweet Love” – #5 in 1976), Lynyrd Skynyrd (“Sweet Home Alabama” – #8 in 1974) and Rufus with Chaka Khan (“Sweet Thing” – #5 in 1976). Two singer-songwriters finish our look at the decade: Carole King, who went to #9 in 1972 with “Sweet Seasons”, and James Taylor, who in 1975 went to #5 with his remake of “How Sweet It Is (To Be Loved By You)”. The original version by Marvin Gaye went to #6 ten years prior. A third version by Jr. Walker & the All Stars just missed the top ten in 1966. The sugar lingered into the electronic 80’s with another eight “sweet” top tens, including two #1 songs in “Sweet Dreams (Are Made Of This)” by Eurythmics (1983) and “Sweet Child O’ Mine” by Guns N’ Roses (1988). Another two besides those chart-toppers were the debut top-40 singles on the Hot 100 for the respective two acts. In 1981, Franke and the Knockouts scored a #10 hit called “Sweetheart” and in 1986, Anita Baker rose to #8 with her soulful “Sweet Love”. On the other hand, one was also the last top-40 single for a solo male singer, Michael McDonald, with his #7 “Sweet Freedom” from 1986. McDonald continued to make the Adult Contemporary survey from several more decades. Rounding out the pack are two #5 singles by Air Supply (“Sweet Dreams”, 1982) and Sade (“The Sweetest Taboo”, 1985) and a #7 charter from Juice Newton, 1982’s “The Sweetest Thing (I’ve Ever Known)”. “Taboo” was the second of two number-one singles for the band on the Adult Contemporary chart; “Thing” was the first of four number-one Country hits for Newton. Here’s where things cut off sharply. Despite a lot of close calls by acts like Mary J. Blige, Mötley Crüe and Sarah McLachlan, only two songs made it to the top ten during the 90’s and both within a few months of each other. In late 1995, Mariah Carey and Boyz II Men created a massive duet in “One Sweet Day”. It officially spent eight frames at the top between 1995 and 1996, though a two-week holiday freeze in-between technically lifts that total to ten weeks. It fell pretty sharply after it peaked, but understandably so. The other song to pull off the trick was “Sweet Dreams” by La Bouche, their second hit on the pop chart. It peaked at #5. For eleven years, not a single “sweet” song could break the top ten. How sour! That curse was broken in 2007 by a gal named Gwen and her Harajuku girls. That, of course, is Gwen Stefani, and she just missed the coveted top spot in 2007 with “The Sweet Escape”, featuring Akon. It was the highest ranking #2 single on that year’s end of the year chart. Returning as a featured artist the next year, Akon, along with rapper Lil Wayne and singer Niia were all included on Wyclef Jean‘s #10 single, “Sweetest Girl (Dollar Bill)”. Lastly, before “Sweet Nothing” came along, the most recent top ten title that brought the “sweet” factor was “Sweet Dreams” from the multi-talented Beyoncé. It reached #5 in 2009. What song do you think is the sweetest of the sweet? Let me know in the comments or on Twitter: @AdamFSoybel. It wasn’t released I don’t think, but Train’s Sweet Rain is a good one. I love Sweet Love, I’m going to download it right now. As always, great informative read. Your blog is always one of my favorites.